SCOTTSDALE, Ariz. – Jan. 19, 2016 – Barrett-Jackson, The World’s Greatest Collector Car Auctions®, is continuing its support of local and national charities with the auction of highly sought-after VIN #001 and custom vehicles during the 45th Anniversary Auction from Jan. 23-31, 2016, at WestWorld of Scottsdale. Barrett-Jackson has raised more than $84.6 million for charity over the past 45 years, and will continue this generous tradition with the auction of the 2017 Acura NSX VIN #001 (Lot #3007), the Chevrolet COPO Camaro VIN #001 (Lot #3005), a custom 2016 Ford Focus RS (Lot #3009), Jay Leno’s one-of-one F-150 (Lot #3006) and others, totaling 11 charity consignments. Acura’s 2017 NSX VIN #001 (Lot #3007) has been long-awaited by supercar fans around the globe. 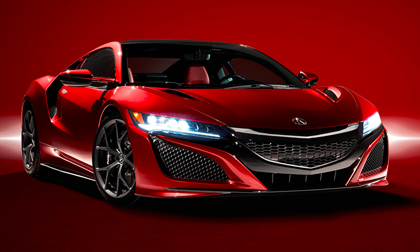 Built entirely in the U.S., the NSX cranks out 573 horsepower and is comprised of a bespoke twin-turbocharged, dry-sump V6 engine coupled to a lightning-quick 9-speed dual-clutch transmission. Sales from the 2017 Acura NSX VIN #001 will benefit the Pediatric Brain Tumor Foundation and Camp Southern Ground, the passion project of Grammy Award-winning artist Zac Brown. Chevrolet Performance’s 2016 COPO Camaro VIN #001 (Lot #3005) is the first of only 69 sixth-generation COPO Camaros slated to be produced. Introduced in November at the SEMA Show, this modern muscle machine infuses legendary COPO performance with a lighter, stronger design and personalized look created by NHRA star Courtney Force. Proceeds from the auction of the Camaro will benefit United Way. Chevrolet will also auction the first retail production and VIN #001 2016 Camaro SS (Lot #3008). This all-new sixth-generation Camaro establishes a new benchmark of performance – performance that has evolved over the past five historic Camaro generations. The sale of this vehicle will benefit Kettering University. Ford Motor Company will auction a hotly anticipated custom 2016 Ford Focus RS (Lot #3009) on Saturday, January 30.The Focus RS is powered by a 2.3-liter EcoBoost® engine that sends 350 horsepower and 350 ft/lbs of torque to all four wheels simultaneously. Mark Fields, CEO of Ford Motor Company, and professional rally driver Ken Block will be on stage when the Focus RS crosses the block to benefit JDRF. Jay Leno, renowned auto enthusiast and star of “Jay Leno’s Garage,” will be on the block on Friday, Jan. 29, to help sell his one-of-one 2000 Harley-Davidson F-150 (Lot #3006). In addition to being a one-owner car titled to Leno, this ultra-rare Ford performance pickup is the only one in existence that features a factory SVT Lightning powertrain. Proceeds from the auction will benefit the National Multiple Sclerosis Society. NASCAR driver and 2012 Sprint Cup Series Champion Brad Keselowski will be on the block for the sale of his 2012 Dodge NASCAR No. 2 Race Car (Lot #3002) driven in the 2012 AAA Texas 500 at Texas Motor Speedway. The sale of this stock car will benefit Paralyzed Veterans of America. A 2015 Chevrolet Z28 (Lot #3003) with less than 500 original miles will cross the block in Scottsdale to benefit the Barrett-Jackson Cancer Research Fund at TGen. A car built for the true racing enthusiast, the Z/28 is famous for its ability to pull more than 1.0g and has lapped the Nürburgring in less than 8 minutes. Benefiting Childhelp through SEMA Cares is the sale of a 2015 Jeep Wrangler Rubicon Edition (Lot #3001) donated by Omix-ADA. The one-off Jeep was featured on the cover of DUB magazine and is customized using dozens of products from leading aftermarket manufacturers. To preview all 11 charity vehicles consigned for the 2016 Barrett-Jackson 45th Anniversary Auction in Scottsdale, click here. For more information on becoming a bidder, follow the link to www.barrett-jackson.com/bid. Experience the 45th Anniversary Scottsdale Auction in style with a Barrett-Jackson VIP Experience Package. Information on available packages and how to be a part of this world-class lifestyle event is available here.